Need help planning your next family reunion? 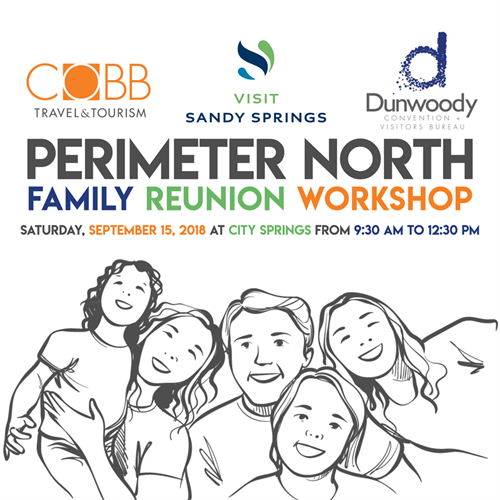 Sponsored by Visit Sandy Springs, the Dunwoody Convention and Visitors Bureau, and Cobb Travel & Tourism, the Perimeter North Family Reunion Workshop will teach tips, tricks, and best practices to make your next family reunion the most memorable yet. Speak to hotels, attractions, food vendors, and more while learning ways to make your family reunion run smoothly. The workshop will be followed by complimentary lunch and a tour of the brand new City Springs facility. This is a free workshop. You must be registered to attend, and availability is limited.